Slingshot, a 4-year-old Whippet, is projected to officially beat the Guinness World Record for Dock Diving on December 15. Update 12-18-18: View footage from the event here. They fly through the air with the greatest of ease, but they aren’t trapeze artists. No, they’re dock-diving dogs – water-loving canines who jump from a ramp or dock into a body of water, competing to see who can travel the farthest or highest. And on Saturday, December 15, at the Orange County Convention Center in Orlando, Florida, many of those high flyers will try to break the Guinness World Record for the farthest jump by a dock-diving dog, which currently stands at 31 feet. These “official attempts” will take place after the North American Diving Dogs/AKC National Championships; any dog to jump more than 30 feet in the competition will be offered two documented jumps in an attempt to break the record. Among the contenders to watch is Slingshot, a 4-year-old Whippet owned, bred, and handled by Rachael Brinkman of Fenton, Michigan. Slingshot is a dock diving champion who has already broken 11 world records with various dock jumping organizations. Having jumped 35 feet multiple times this summer, he already unofficially beat the 31-foot Guinness record. The current record was set in 2012 in a tie between two dogs: Taz, a black Labrador Retriever, and Cochiti, another male Whippet. “If I was standing at the edge of a building and wanted to throw a toy off of it, he’d be, like, “OK, cool – see you at the bottom!’” she laughs. Rachael Brinkman says vertical distance is just as important as horizontal distance in successful dock diving. Photo courtesy of Whitney Rupp. When it comes to dock diving, Brinkman explains the formula for success: Speed + pop = distance. “Pop” refers to verticality – jumping not just far, but high, which helps increase a dog’s horizontal trajectory. And it’s something Brinkman had to train Slingshot to incorporate into his jumps. As a result, Brinkman has taught Slingshot that he can chase his toy in the air, too, “because if the dog doesn’t think there’s a chance he can catch it, he won’t even try.” By letting Slingshot snag his airborne toy every once in a while when they train, Brinkman has built in that needed extra lift in the air. As for speed – well, aerodynamic Whippets are created for just that. 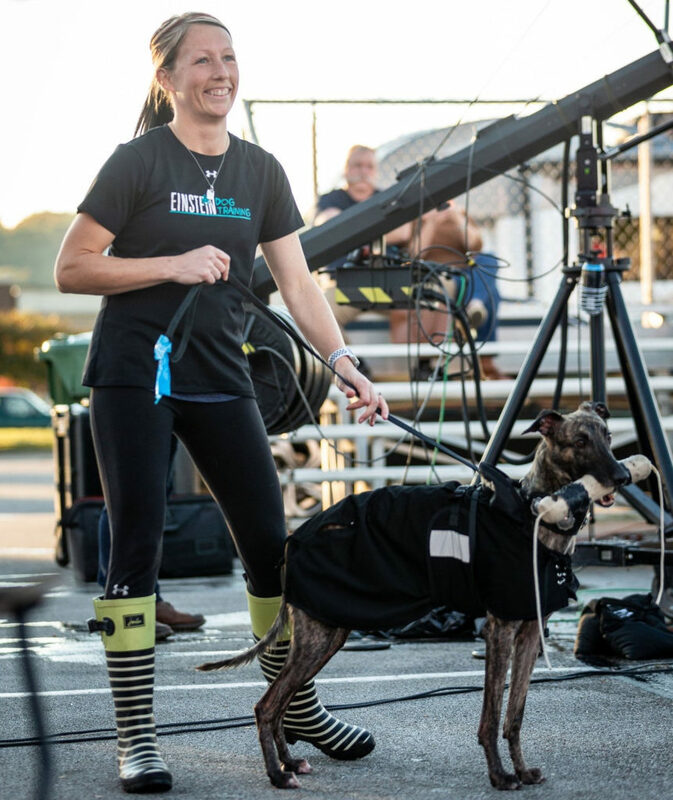 “This isn’t our only sport,” adds Brinkman, who also competes with the aptly named Slingshot in flyball, a kind of canine relay race, as well as oval-track and straight racing, which are specialized speed competitions for Sighthound breeds. Brinkman, who is a professional dog trainer and owner of Einstein Dog Training, will start the 18-hour drive to Florida on Wednesday. But first, she plans a quick stop at the vet. It turns out that records aren’t the only thing that Slingshot has broken: Last month, he mysteriously broke his tail, though Brinkman is cautiously optimistic he’ll get the final go-ahead to get jumping. And after three weeks of mandated crate rest, this blur of brindle will doubtless be raring to go. The AKC National Championship presented by Royal Canin will take place Saturday and Sunday, December 15 & 16, 2018, in Orlando, Florida. Tune in to AKC.TV, or download the AKC.TV app on Roku, Apple TV, or AmazonFireTV to catch the live stream starting on Saturday, December 15 at 12 p.m. ET. Watch the TV premiere on New Year’s Day on Animal Planet at 6 p.m. ET. Encore performance airs at 12 a.m. ET.